Dyson V11 Absolute is the latest update to Dyson's long-running line of vacuum cleaners and It. Is. A. Beauty. And a beast. It builds on the T3 Award-winning success of the Dyson V10, which it very closely physically resembles, and boosts both the power and the smartness of its cleaning, with 20% more suction, a new cleaner head that 'intelligently adapts for optimum cleaning on all surfaces' and improved battery management that could allow you to vacuum for longer. Great! Sadly, the V11 Absolute does NOT allow you to clone yourself, as the slightly surreal promotional image might suggest. Dyson V11 Absolute has a few things to prove as, if you cast your eyes towards our best cordless vacs top 10, you'll see that, just for a change, a Dyson does not sit at #1. That's because other brands have seen the financial success Dyson has had with cordless vacuum cleaners, upped their game and, in some cases, now provide comparable cleaning power, for a lower price. To tackle that, and justify the Dyson Premium, the V11 Absolute introduces 'intelligently optimised' power to give 'twice the suction of any cord-free vacuum at the cleaner head,' via no fewer than three microprocessors. That's quite a nebulous term of course but I think it essentially means, 'sucking harder on mucky carpet and sucking less on relatively clean floors, especially hard floors'. The new High Torque cleaner head with Dynamic Load Sensor means you get the headline '20% better' suction compared to the V10 Absolute – which was itself not lacking in suction. In conjunction with the new battery modes it should mean that, on average, you get a bit longer running time from your Dyson. The brand quotes 'Up to 60 minutes fade-free floor cleaning' in the lowest-powered, 'Eco' mode, but you should eke out a longer period of fun, cleaning your floors, in the Auto mode as well. It's doubtful Boost mode will give you much more than the usual 10-15 minutes or so, but that remains to be seen. What is for sure is that you'll have a better idea of how long your Dyson V11 has to run, as there's an all-new LCD screen that displays remaining run time, as well as 'machine performance'. Allergy sufferers in particular will be glad to know that advanced filtering 'captures 99.97% of particles as small as 0.3 microns', making this a valuable addition to Dyson's suite of wellness products, which also includes the Dyson Pure Cool Me air purifier and the new sun-mimicking Dyson Lightcycle lamp, a sort of designer Philips Hue rival. The only other devices I've seen that do this are Vorwerk's mega-expensive VK200 (although that is corded, so it's not intended to extend battery life) and Miele's Scout RX2 robot vac. The result is better cleaning on carpets and more efficient cleaning on hard floors. 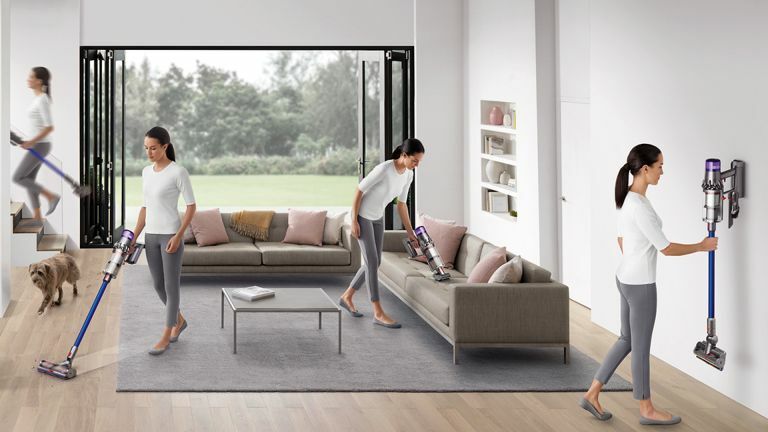 Dyson also claims that the new head's 'stiff nylon bristles drive deep into carpet to remove ground-in dirt, and anti-static carbon fibre filaments that capture dust from hard floors and crevices. An integrated digital motor spins the brush bar up to 60 times a second,' while the head is 'sealed to the floor,' via a polyurethane skirt. The new LCD screen also reminds you when to clean filters or clear blockages. The bin is easy to empty, using the same mechanism as the V10.